After 12 months of conducting learning sessions in Ghana and Burkina Faso to develop the Community Choices for Water (CCW) tool, an alpha version of the tool has been tested in Cheshei community. The Pacific Institute and NewEnergy field staff tested the tool in the community between March 19 and 29 to examine how households could be empowered with knowledge of water treatment technologies to solve their acute water shortage challenges that compel them to drink unclean water. Mr. Nachinab pilot-tests the alpha version of the tool with one household. Based on recommendations on where to acquire parts for the chosen technologies, households were able to get potable water to drink. Though the Cheshei community is connected to the urban water supply, the taps are opened only once or twice a week, and the pressure is not enough to force water into the overhead tank/reservoir provided for the community. The community is then forced to rely on a polluted surface water source about 4 km away. The Community Choices for Water tool — a library of water treatment technologies which requires a user to respond to a set of questions before arriving at recommended solutions — also helps connect communities and households to technical and funding agencies and vendors for assistance in the implementation of chosen water treatment technology. According to Ms. Mma Torro, “The CCW tool is just a perfect intervention in this community as we need more knowledge on how to treat our water.” Mma Torro was aware that clear water did not always mean clean water and sometimes requires secondary treatment technology to deal with bacteria. She praised the CCW tool for disseminating knowledge of using Moringa seed — a resource that is commonly found in the community — to treat water. Moringa trees from which the seeds are taken grow in tropical and arid to semi-arid areas. The dry seed is crushed in to smaller pieces (or ground) and a handful of the ground seed is introduced into a bucket of water and stirred for a few minutes. The ground seed coagulates the dirt and settles to the bottom. The water is then filtered into a clean container in which secondary treatment options are applied to kill bacteria in the clear water. Learn more about the Community Choices Tool and use of the Moringa seed. 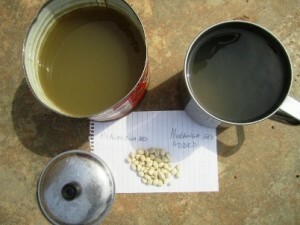 Here we have improved water quality as a result of implementing a solution recommended by the tool during the pilot exercise, use of the Moringa seed.